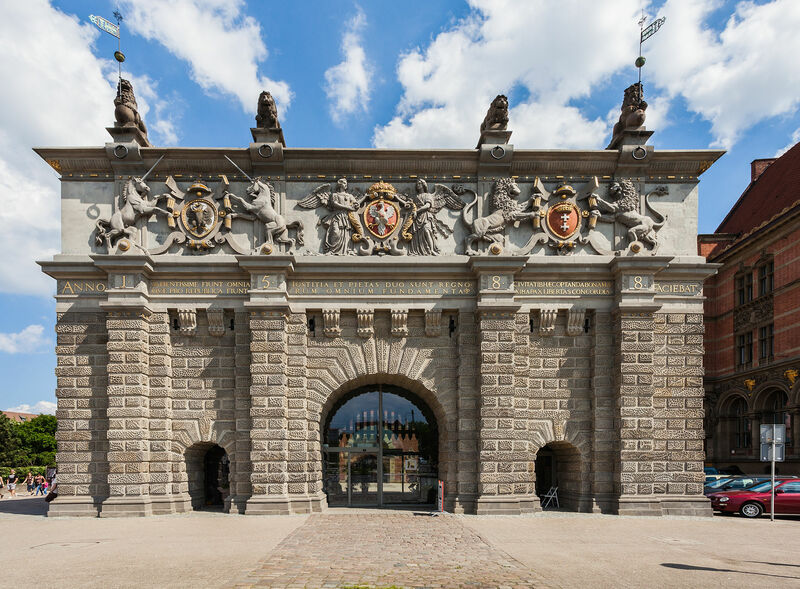 Gdansk has numerous impressive gates allowing entrance into the old town. The first two you see here are about 50 meters apart, in between there is another old structure that houses the amber museum, amber having been a major trade item in earlier times. 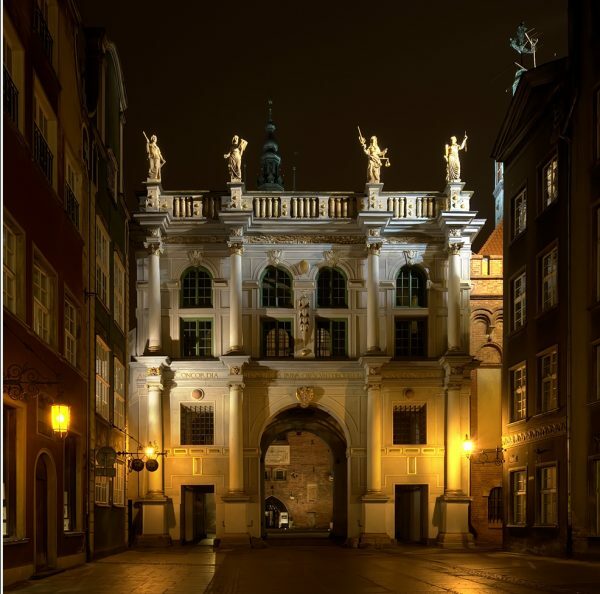 The Golden Gate in the style of Dutch Mannerism (1612–14) replaced a 13th-century gothic gate, called the Brama Długouliczna (Long Street Gate). It is located on ulica Długa, the main street, which you see framed through its arch. 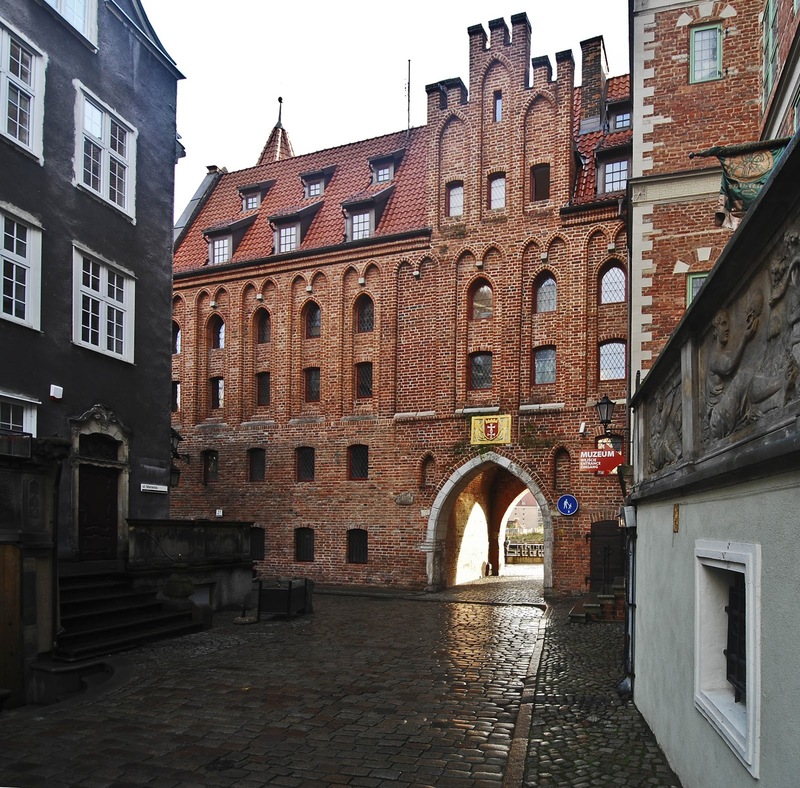 Along with Brama Wyżynna, just 50 meters away, and Wieża Więzienna , it was part of the old city fortifications. It sits next to the late-gothic building of the Brotherhood of St.George. Inscribed in Latin: Pax (Peace), Libertas (Freedom), Fortuna (Wealth) and Fama (Fame). On the east side they are Concordia (Agreement), Justitia (Justice), Pietas (Piety) and Prudentia (Prudency). The Latin inscription: Concordia res publicæ parvæ crescunt – discordia magnæ concidunt (“In agreement small republics grow, because of disagreement great republics fall”). Largely destroyed by Soviet shelling, beautifully rebuilt in 1957. 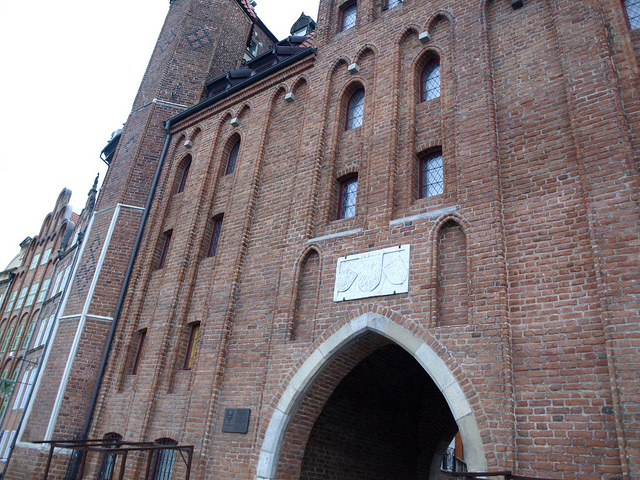 They built this brick Gothic style gate in 1450 at the end of Chlebnicka Street, facing the Motlawa River. On that side of the gate there is a shield with two crosses but no crown. This was the first symbol of Gdansk. It is not displayed elsewhere in the city. On the street side you see a stylized lily, this the gate is also called the Lily Gate. There are various varieties of lilies in Gdansk. Mariacka Street has both the tall tower of Mariacka Church but also Mariacka Gate which connects to the Old Town. It was built in 1485 with the two towers with typical small windows. In this photo you can also see the cobble stone streets which are throughout the old town. The Royal Route, which the king would pursue on city visits, passed through the Golden Gate, the Upland Gate, and this one. 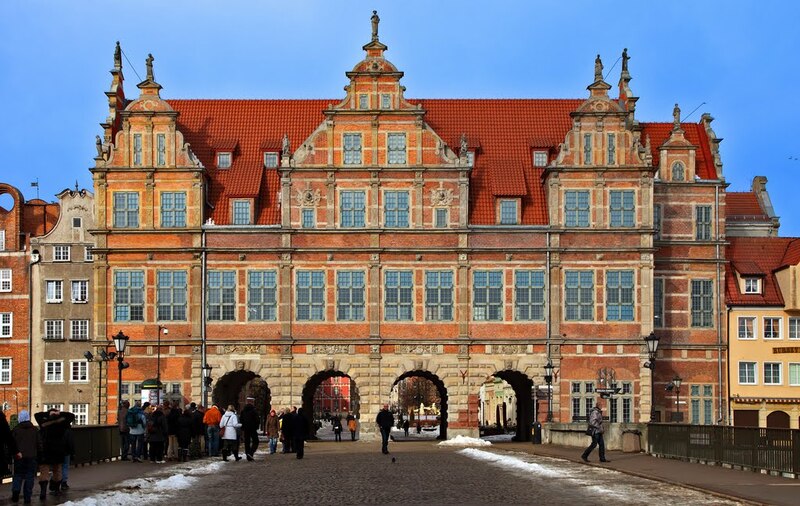 The Green Gate was built as the official royal residence while in Gdansk, which no king ever used, considering its location too close to street traffic, noise and the citizenry. It was inspired by Antwerp’s City Hall. The Amsterdam architect Regnier built it in 1568-71. Today the Green Gate houses the National Museum. Next Post: It’s impolite to stair!